A 3-seminar series designed to teach you everything you need to know about the art of public speaking. 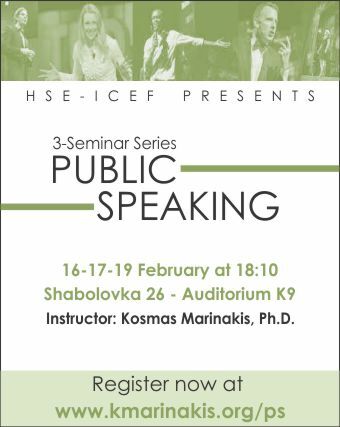 ICEF and Econ Faculty professor Kosmas Marinakis will go over the secrets, tips, examples, real cases, do's and don’ts of how to present your work successfully in front of a live audience. The seminar is an activity that you may add to your CV and therefore we will provide a proof-of-attendance certificate to those who will attend all three seminars. All attendees must register online for entrance, for diploma and to receive material pack. Register here.